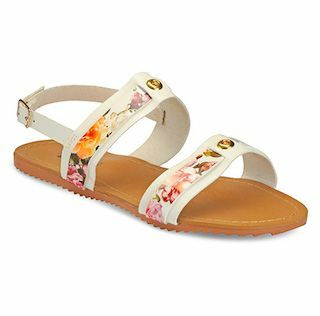 Pretty, Fun, Summery Sandals - All Under Rs 499! 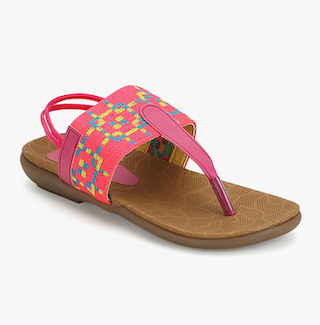 Bring out all your pretty clothes, because you’ll definitely want to match these sprightly summer sandals with them! Bursts of colours, stylised patterns and a lot of fun - here are our favorite picks and that too all under Rs.499. Go ahead and grab a few! 1. The Cute Bowed One! What can brighten up your day better than shiny metallic straps with a pretty black bow on them! For all the times you want to add some sheen to your dress and make your ensemble fabulous, this will be your girlfriend. Price: Rs. 480. Buy it here. You deserve a whiff of bright coloured sandals this summer. The refreshing colour and easy pattern makes this one delightfully easy to carry off. Just let your feet do the talking in this cute pair. 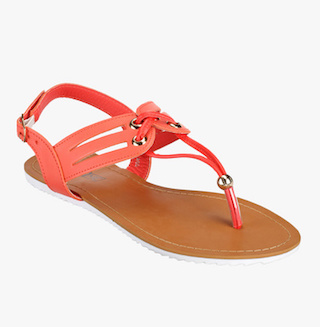 Another happy coloured beauty - coral will look amazing when you pair it with your favourite denims. It is unfussy and adds a playful pop to any dull outfit. Brighten up your mood instantly in these sandals and have fun! Price: Rs. 499. Buy it here. Floral prints have been all the rage for years and we can never get tired of them. 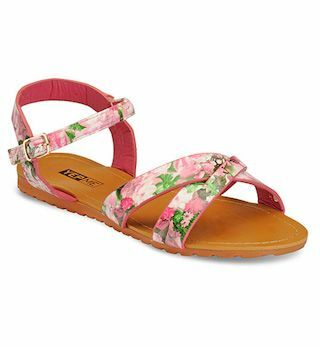 These pretty pink criss-cross strappy sandals will look so sweet that you would never want to take them off! Pair them with your favorite summer dress and look pretty as a picture. We can only imagine and smile. Price: Rs. 499. Buy it here. Every girl needs a pair of fierce blue thong sandals. This one is fiery and yet so feminine because of those tiny triangular studs on the band. Try experimenting with colours this season and match these with a bold red top! Price: Rs. 499. Buy it here. 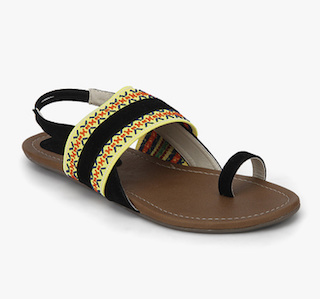 Black will never go out of fashion, so top up your shoe collection with these black embroidered sandals. The interesting details on the band makes this one even more fascinating. They’re cute and unique and will go with all your ethnic outfits! Price: Rs. 494. Buy it here. Another floral wonder, this multicoloured floral print on white is all that we are dreaming of this hot summer. It is bound to make your whole outfit look more charming! We can hardly wait to grab this one! Price: Rs. 499. Buy it here. Whether you want to wear this with an Indian outfit or a Western one, both will look amazing no matter what. The geometric patterns on the band attract attention towards it, for the right reasons! Price: Rs. 439. Buy it here. HAVE A STORY IDEA FOR POPxo? If you want to hear about it, we can write about it! Just tell us your idea here! MUST-READ: The Cutest Flats You Could Possibly Find… All Below Rs 700! MUST-READ: 12 ADORABLE Flats Under Rs 1,000 You Absolutely Need!